The most oft-asked question from brides and grooms is "what do you think of wedding favors?" Hmmmm...how to answer. Of all the details that go into planning a wedding, ironically, I think choosing favors can be one of the hardest decisions to make. I've witnessed couples wrack their brains over the perfect gift for their guests. My advice is to think practically when choosing a favor. When scouring the internets for the elusive unique favor, put yourself in your guest's seat and consider what you would like to take home and use. Better yet, think what you'd like to nibble right there at table number twelve. I always encourage my brides and grooms to give edible favors when possible. Why? Well, from the planner's birds-eye view, when I am clearing table at the end of a wedding, I either see lots of favors left unopened, or I see lots of favor boxes opened and the goodies are always missing. 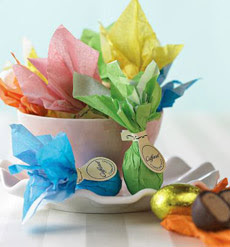 Ninety-nine percent of the time when a favor is edible, it is consumed before the evening is half-way through! On the other hand, when a single votive holder or other such gift is left for guests, at the end of the evening I end up packing those back up for the bride and groom to take back home. Sad, but true. Another great idea that I'm seeing more often: In lieu of a favor, the bride and groom make a donation to their favorite charity in honor of their wedding day and their guests. AWESOME. This gift is truly a gift. If you choose this route, you can tastefully denote your "wedding favors" in either the program or on the menu card or on the guests seating assignment. While I can't take credit for this brilliant idea, I have been pitching the idea of what I call the "un-photobooth" all year long. 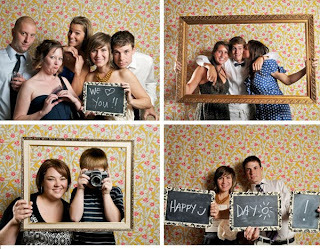 I love the addition of a photobooth to a wedding; guests have a great time creating their "shot," while the bride and groom benefit from unexpected poses and spontaneous groupings of all their wonderful guests. 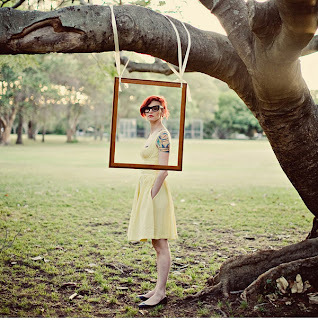 On the downside, old-fashioned photobooths, which require delivery, setup and often an attendant or two to operate throughout the event can sometimes be pricey when budgets are tight. This is where DIY booths come in. Set out cameras and film (old polaroid cameras are a fun option), a few fun props, perhaps a piece of fabric or beautiful curtain panel to act as a backdrop if your venue's natural surroundings aren't the look you're looking for, and, voila!, photobooth at a fraction of the cost! In terms of props, try feather boas and funky hats, or continue the theme of your wedding by adding items that reflect the overall look of your day, such as vintage glasses or handheld chalkboards as they've done in the photos above. You'll have fun, spontaneous photos of your special day to enjoy for years to come!